I realized that I wrote multiple posts on what I wore to my sister’s wedding, but I forgot to tell you what my parents wore to the wedding and what we got for grandma for the reception. We already knew which styles my mom liked because of Pinterest. Last summer, she started looking around in stores and tried on some dresses, we narrowed it down to the exact style that she likes on. We realized that sequins were too much for her, but lace is too plain…so we went with a morph of the two: lace with some beading. She tried on Tadashi Shoji dresses, but she didn’t like the style on her. So, we ended up with two dresses by Adrianna Papell. I ordered them from Nordstrom online which was a bit of a gamble but we bought one dress in her regular size and the other we ordered a size up in petite (that’s all they had in stock). Adrianna Papell dresses are beautiful for bridesmaids and mothers of the bride/groom. I think Adrianna Papell will be my mom’s go-to designer for whenever she needs a nice dress. She also got a blue lace shift dress by Adrianna Papell that she wore to the wedding shower in October. They are affordable and have a bit of sparkle. She ended up wearing the one on the right to both the wedding in Mauritius and the reception in Toronto. The one on the left was the one that we ordered a size larger, but in a petite and M felt it was a bit too short because it ended a bit higher up than the other one. For shoes, she got a pair of Nine West Austin pumps in Gunmetal. These are interesting because depending on the lighting, they look gold or silver or a mix of both (as you can see on the left and right, these are the same colour, but the lighting has changed its appearance). For dad’s suit, we knew he was going to get a navy blue suit (contemporary fit) because the groom would be wearing a dark gray suit and my dad didn’t want to match. My dad tried on several suits: Canali, Hugo Boss, Harry Rosen’s brand, Michael Kors, Ralph Lauren, etc. He ended up with a dark blue one from Harry Rosen by Z Zegna. He wore it with a plain white button up shirt and a blue chevron tie. There was some deal at Harry Rosen (spend a certain amount and get an accessory $100 off or something so the tie was basically free). He wore his classic Florsheim leather wingtips in Black (which I believe are older than me). I don’t really think there’s a need to post pics for these because suits are kind of all the same and they don’t even sell the Florsheim shoes anymore. The reason I post pics of M’s dresses are to help Mothers of the Bride/Groom who are in search of an outfit. For my grandma, we knew what style she wanted: flowy skirt, not too fitted with beading…lots of beading. My grandma loves her bling. So, I ordered her two dresses from Nordstrom as well. Two embellished gowns by Pisarro Nights. She liked the black one better and returned the blue one because it didn’t fit quite right (otherwise, she probably would’ve kept it for her next grandchild’s wedding). I don’t know what shoes she wore, but they were black pointed toe kitten heels. 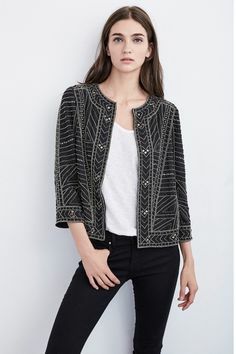 On IG, after Christmas, I posted a pic of a jacket (see below) that we got gma from Mendocino that’s black and beaded. She wore it ON TOP of her black and beaded dress when she got cold. Coincidentally, they matched even though they are different brands (the jacket is by Velvet, you can see a full-length view: here). We also had to order one dress in regular size and another in petite (but one size up). The smaller size didn’t quite fit, but the petite one that was one size up fit perfectly. My mom and grandma seem to be quite lucky when ordering online. I haven’t been so lucky, it’s either a hit or a miss. Recently, I’ve had to return several pairs of pants because they didn’t fit quite right. Don’t forget to invest in some seamless underwear!! Check out my blog post on Knixwear underwear.